Commas and their usage have arisen in my conversations with clients again lately, so I felt it was time to dust off a piece I wrote last year on managing them. If you have seen this post already, there is nothing new here–commas and their usage don’t evolve with our changing language. Since the usage of commas is slow to evolve, why are they so difficult to figure out? And conversely, why do some people get so jacked up over misplaced commas? The rules are a little confusing at first because there are several exceptions. Remember, for the casual reader, misplaced commas are like road signs gone rogue–one minute everything is fine and the next you are going the wrong way down a one way street and don’t know how you got there. Commas and the rules for their use exist for a reason, and if we want the reading public to understand our work, we need to follow them. 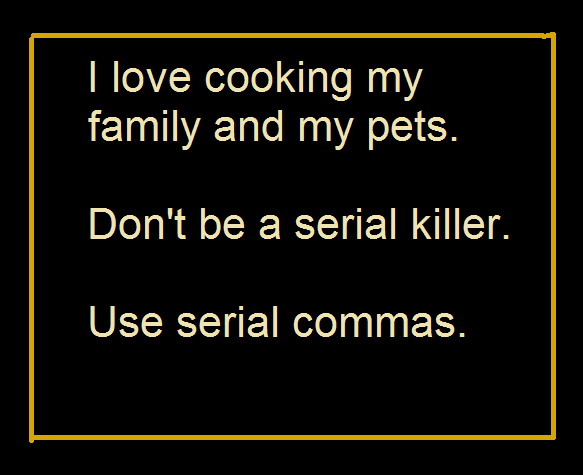 Do not put a comma after a conjunction. 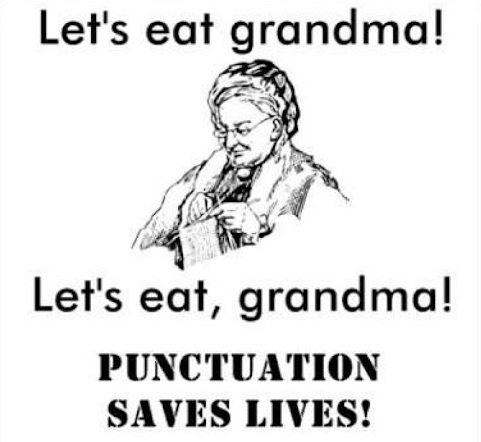 If needed, commas go before conjunctions. A comma should be used before these conjunctions: and, but, for, nor, yet, or, and so to separate two independent clauses. They are called coordinating conjunctions. However, we don’t always automatically use a comma before the word “and.” This is where it gets confusing. Compound sentences combine two separate ideas (clauses) into one compact package. A comma should be placed before a conjunction only if it is at the beginning of an independent clause. 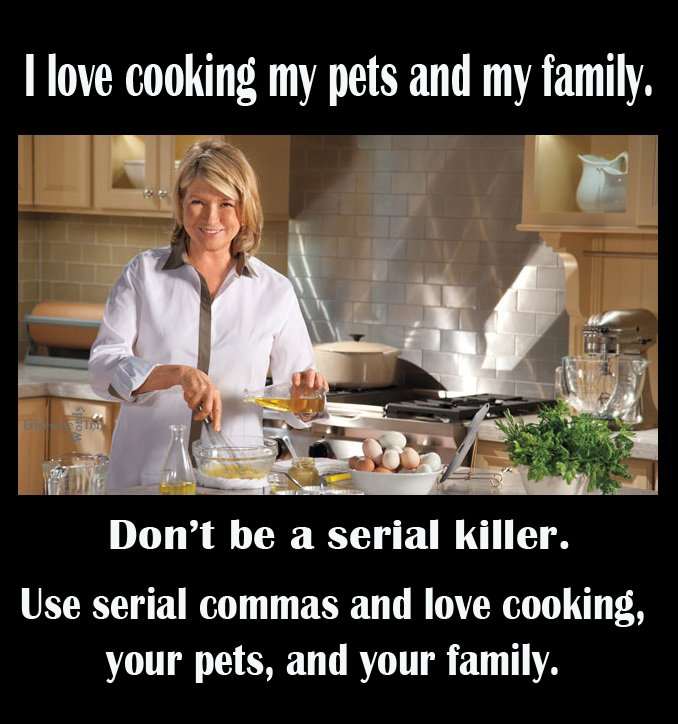 So, use the comma before the conjunction (and, but, or) if the clauses are actually standalone sentences. If one of them is not a standalone sentence, it is a dependent clause, and you do not add the comma. Oh YES, we DO use serial commas to prevent confusion! You’ve all seen the meme: I love cooking my pets and my family. On a personal level, I do love cooking, my pets, and my family. (But not in the same pot.) They’re happy that I use serial commas. One of my favorite personal failings is the notorious comma splice. Apparently, it’s bad form to join two independent clauses with a simple comma. This error is called a comma splice. Commas can easily get out of control for me because I tend to hit the comma key whenever I pause in my thinking when I am in the first draft phase. At that point, I am more concerned with just getting the words down than I am form and style. Large portions of this post were first published by Connie J. Jasperson © 2016-2017 under the title, Commas, Morsels of madness or necessary evils? 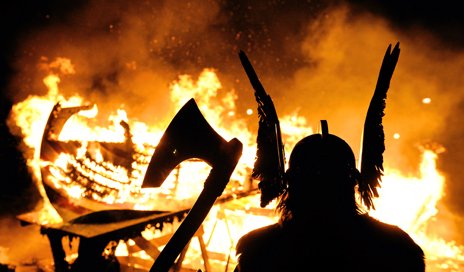 on Life in the Realm of Fantasy on January 25, 2016. It has been re-edited and recycled. 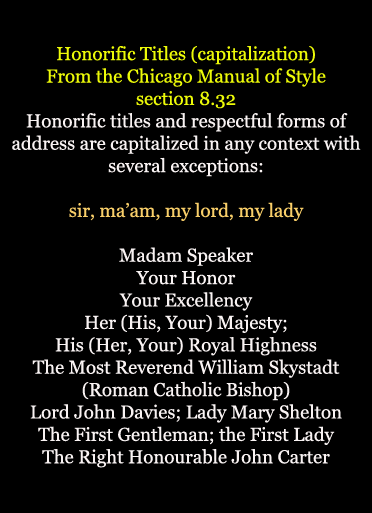 Commas, The Chicago Manual of Style Online, © http://www.chicagomanualofstyle.org/qanda/data/faq/topics/Commas/faq0018.html accessed 08-02-2017 The Chicago Manual of Style 15th edition text © 1982, 1993, 2003 by The University of Chicago. 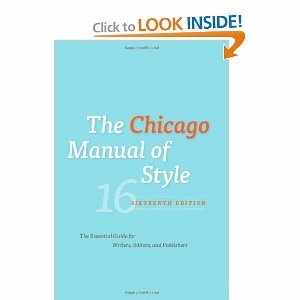 The Chicago Manual of Style 16th edition text © 2010 by The University of Chicago. The Chicago Manual of Style Online © 2006, 2007, 2010 by The University of Chicago. The Chicago Manual of Style is a registered trademark of The University of Chicago. I discussed this topic a while back, but having read several books written by authors who clearly had no idea there are rules about terms of endearment and capitalization, it bears repeating. Be slightly patronizing in situations where the speakers are not friends. If the speaker is not related to the person in question, do not capitalize it. You must also capitalize the words “sir” and/or “madam” when beginning a letter or an email. “Good grief,” said the king. Again, consider the context. When writing dialogue: if your speaking character is in the military and the person he/she is addressing has a military rank above them, and is speaking in their military capacity you must capitalize it. The exception to this rule is if a younger person of lesser rank is talking to an older person of higher rank in an informal setting. At that point, the younger person is simply speaking respectfully to an older person, and “sir” does not need to be capitalized. #amwriting: son and sir: to capitalize or not? Terms of endearment are often used in casual conversation. 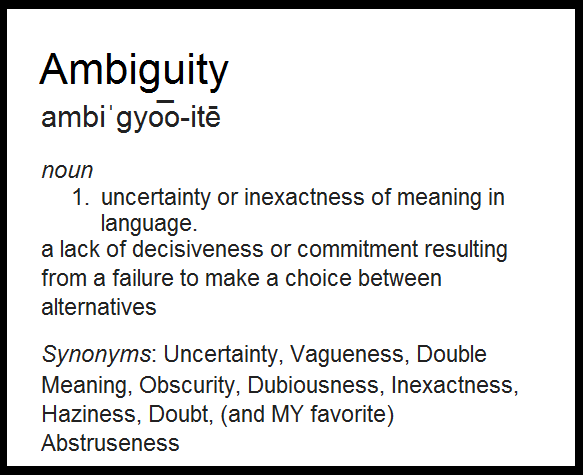 Each has their own implications which are highly dependent on tone of voice, body language, and social context. They can be fairly impersonal, denoting a friendship. Conversely, they can be intimate, indicating a close relationship. Used by perfect strangers they can also be patronizing and rude. This brings us to the word “son.” Again, as in so many other aspects of the writing craft, context is everything. “I love you, Son,” said the doting father. But, in the past, instead of a boy’s name, men commonly called boys boy, kid or son, not as a name but as a neutral term of endearment. My interpretation of the word “son” in casual conversation is like this: I feel it should not be capitalized if it is being used to indicate friendship, or in a patronizing fashion. Wikipedia claims that in an informal setting, such as a pub or gym, the use of terms of endearment is a positive politeness strategy among men. A term like “mate” or “son” shifts the focus toward the friendship existing between the speakers, yet maintains a slight emotional distance. Hand me the scissors, darling. Grab that remote for me, love. How’ve you been, old son? The above endearments are not between speakers with a deep emotional attachment. They indicate camaraderie and nothing more–they are neutral. Therefore, “son” should not be capitalized if it is being used as a neutral term of endearment when speaking to a person you are not related to. “Okay, son. Tell your ma I stopped by,” said his neighbor. “Get off your high-horse, son,” said man next to him. As stated above, The Chicago Manual of Style’s preference has always been to lowercase pet names, (which are terms of endearment) but in reality, you can’t go wrong unless you’re inconsistent, since the issue is guided by preference rather than rule. 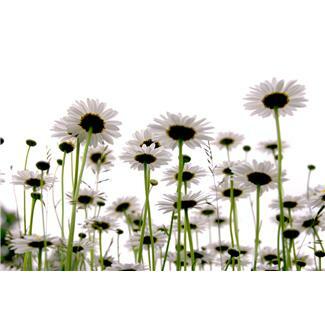 a greater liking for one alternative over another or others. So, if you do choose to capitalize the word “son” when used as a term of endearment, be consistent. But also be aware that it’s not necessary. When writing dialogue: if your speaking character is in the military and the person he/she is addressing has a military rank above them, THEN you must capitalize it. If you are writing about Sir Paul McCartney’s favorite brand of socks, capitalize it. Just refer to me as “my lady” from here on out. Email doesn’t get better than that! There are times when the vagaries of modern English (previous error in capitalization edited by Stephen Swartz) get in the way of reading what could be a great novel. Some weeks I see six or seven books, both indie and traditionally published, before I find one book worth reviewing for my book review blog, Best in Fantasy. As authors, we are all overcome with the urge to shout to the world, to immediately show the world our precious child, to rush to publish it now. It is the rare author who can write prose that is fit to read in his first draft–if that author actually exists, I’ve never read his work. For the indie, this is fatal. This is why I highly recommend hiring a reputable editorial service to go over your manuscript, even if you plan to submit it to a publisher. After all, why not submit the best work you can, rather than risk being stuck in the slush pile? An editor will have several reference manuals at his/her hand, and will help you realize your vision, whittling away at the block of granite you gave birth to and love so much, carving away the unnecessary and extraneous words and cliches until the book emerges in all its glory. When I am editing, I refer to The Chicago Manual of Style, the Oxford A-Z of Grammar & Punctuation, and of course, Strunk and White’s Elements of Style. As I have been through the process of being edited and hate that horrible feeling of being called to task on silly things, I often refer to these books when I am second guessing myself in my own work. What are the silly things, you ask? They are things we learned in grammar school but forgot as we grew older and didn’t use them. 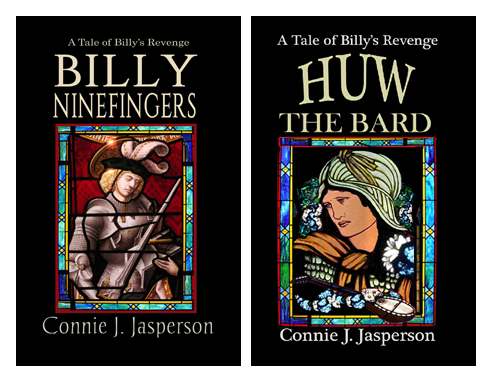 Small things like when to capitalize an honorific title, and when not to–something that crops ups regularly in my work as I often write in a medieval setting. Consistency is important, so we must know when to capitalize titles and honorifics–words like king, and majesty, or even lord. 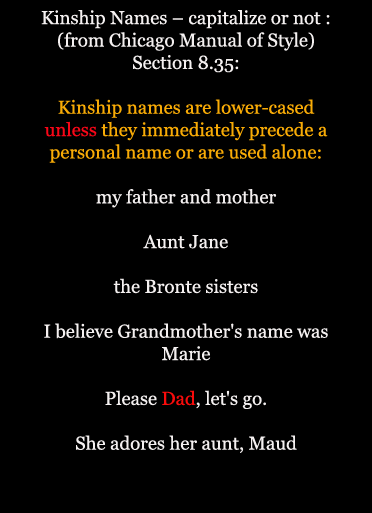 Also, when to capitalize familial titles such as father, mother, son and aunt. If you are determined to do it wrong, at least have your roommate ensure that you have done it that way throughout the entire manuscript, rather than sometimes one way and sometimes another, which is the normal, natural way to write a first and even second draft. Editors not only correct grammar, they check for consistency. They are worth their weight in gold. They’re more important than the fine artwork for the cover, more critical than the catchy blurb. 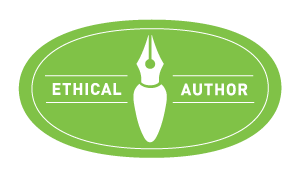 We live in the wild west of the publishing business, and we find ourselves doing whatever we can on the cheap to get our book published. DON’T skimp in this area, if you value your reputation. Once you have published, it’s a pain in the backside to unpublish, have it edited, reformat it, and go through the launch all over again. Remember, we see what we meant to write, not what is actually there. But you don’t have to listen to me–experience is the great humiliator. Oh golly gee–it’s that time of year again. What do I use, “that” or “which?” And what the heck are those rules again? Good grief…where did I put that bookmark for the online Chicago Manual of Style…. What? Doesn’t everyone have a bookmark in their list of favorites so they can immediately access a FREE style manual when questions of style arise? Good lord people–we aren’t talking shoes and handbags here! We’re talking RULES! Specifically, the rules fer writin’ and ropin’ in them thar clauses! And always remember–for the indie author, free is good. If you don’t have the funds to buy Strunk and White’s Elements of Style, for the love of Dickens, use the internet, Tiny Tim! Personally, I use both manuals. The traditional approach to the question of “that versus which” is to use “that” with restrictive clauses and “which” with nonrestrictive clauses. 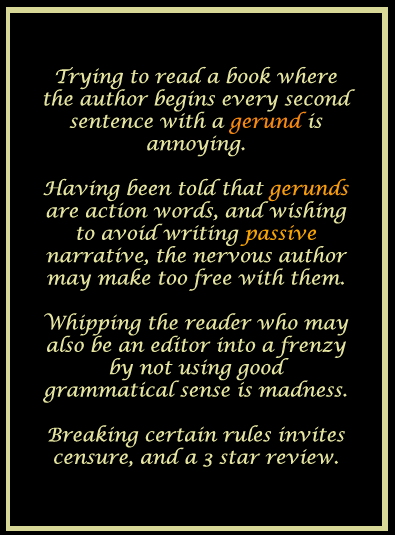 While some writers seem to have abandoned the distinction entirely, no better rule has come along to replace the traditional rule. Moreover, the rule is easy to master. But what, you ask, is a stinking restrictive clause and why do you need one? The photograph that was hanging in the hotel lobby was stolen. The use of “that” in this sentence is correct if the reader intends to single out the one photograph that was in the hotel lobby as the stolen photograph. However, if there were several photographs hanging in the lobby, this use would be incorrect, since it would mislead the reader into believing that there had been only one photograph in the hotel lobby. The restriction here tells us that the one photograph that had been hanging in the hotel lobby was stolen — not the photograph in the cocktail lounge, or the one in the guest library, or any of those in the restaurant. According to Wikipedia, the Fount of all Knowledge: A non-restrictive clause is a clause in which a noun phrase that is used to avoid repetition (as the referent of an anaphor, meaning that it is substituted by another word but refers to the same noun) is determined by its antecedent where the dependent is peripheral (non-essential) in the secondary constituent, as opposed to a restrictive clause, where the dependent is central (essential) to its primary constituent. A non-restrictive clause does not identify the referent of its noun, but only provides information about it. The officer helped the civilians who had been shot. The officer helped those civilians who had been shot. In this example, there is no comma before “who”. Therefore, what follows is a restrictive clause (not all of the civilians had been shot). The officer helped the civilians, who had been shot. Here, there is a comma before “who”. Therefore, what follows is a non-restrictive clause. It changes the sentence to mean that all the civilians had been shot. The photograph, which was hanging in the hotel lobby, was stolen. Explanation: While this nonrestrictive use tells us that the photograph was hanging in the hotel lobby, it does not tell us which of the several photographs in the hotel lobby was the stolen photograph. It would be incorrect to use this nonrestrictive clause if there had been only one photograph in the hotel lobby, as the sentence leaves open the possibility that there were others. Combining Restrictive and Nonrestrictive Clauses. One can provide both limiting and nonlimiting information about a subject in a single sentence. Consider the following. The Ansel Adams photograph that was hanging in the hotel lobby, which was purchased in 1969 for $100,000, was stolen. The restrictive clause beginning with “that” tells us that only one Ansel Adams photograph was hanging in the hotel lobby and that it was stolen. 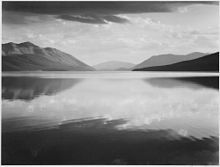 The nonrestrictive clause beginning with “which” tells us what the owner had paid for the photograph, but it does not tell us that the owner did not pay another $100,000 for another photograph in the same year. It does not limit the possibilities to the Ansel Adams photograph that was in the lobby. Restrictive and Nonrestrictive Clauses beginning with “Who.” When writing about human beings, we use “who” rather than “that” or “which” to introduce a clause telling us something about that human being. Since “who” is the only option, we distinguish between a restrictive use and a nonrestrictive use by the use of commas. Old Mrs. Jasperson, who drives a Ferrari, is going through her second childhood. Yes, I am a dreamer. Indies are lucky to be able to afford bus passes. See? 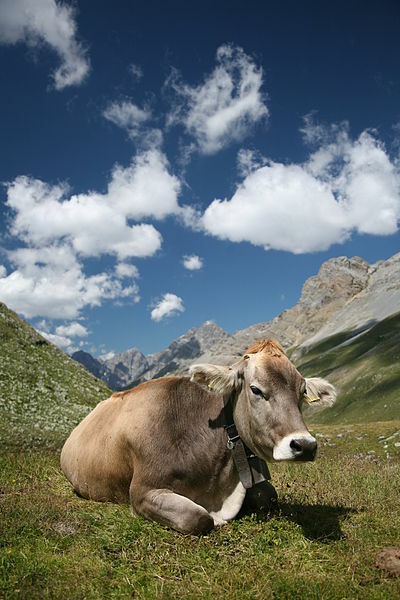 I do understand the principles, and when it comes to theory, I can talk clauses and quarks ’til the cows come home. But truthfully folks, when I am in the zone, I just bash out the words and trust that my editors will not only rein me in when I get too free with my commas, they will weed out all the extraneous “thats” and “whiches” that creep into every author’s raw manuscript.